Our comfortable rooms have with cable TV and WI-FI, in a quiet, serene setting. Great local fishing and rafting activities and a wide variety of things to do. Enjoy the wondrous coastline with it's wonderful sunsets or nearby Trees of Mystery. The Hiouchi Motel is located in Hiouchi, California at the crossroads of the Smith River National Recreation Area, Redwood National Park and the Jedediah Smith Redwoods State Park. Centrally located, just 8 miles East of Crescent City, California and 19 miles East of Brookings, Oregon, this quiet, cozy 17 room motel is a favorite to visitors of Del Norte Country. We offer clean, comfortable lodging with 1 and 2 bed rooms with cable TV and WI-FI, in a quiet, serene setting with a picnic area, river activities and more. This setting is ideal for family gatherings, special events or just relaxing and enjoying nature at it's best. Well behaved dogs are allowed. 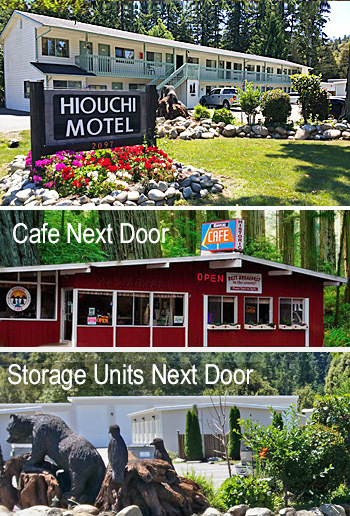 Hiouchi Motel is situated along the Smith River and allows easy access to local river activities such as fishing, kayaking, rafting, river guides and day trips. Steelhead, Trout and salmon fishing is a favorite pastime. The Smith River is one of the last major free flowing rivers in California, it is clean, clear and a natural spawning ground for the native fish. Enjoy the nearby attractions and activities such as bicycling, camping and hiking in the wonderful heart of the Redwood forest. For area activities see our Attractions Page. CANCELLATIONS ARE 48 HOURS IN ADVANCE or we will charge the full amount of the first night. HIOUCHI CAFE IS NEXT DOOR, Serves Breakfast, Lunch & Food To Go.